CAMPBELL, CA June 3, 2013 --- Psycho Donuts has created the world’s first Foie Gras Mousse Donut, dubbed The Foie Bomb, which will be available to customers for free on National Donut Day – while supplies last – on Friday, June 7, 2013. 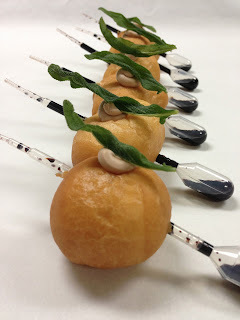 The Foie Bomb - with Flavor Pipette! The Foie Bomb is a raised donut hole, filled with Unctuous Foie Mousse. The donut is severely pierced with a pipette containing Honey, Fig, and Balsamic Gastrique. The Foie Bomb is then topped with crispy fried sage. Customers are encouraged to squeeze the contents of the pipette into the Foie Bomb’s center while simultaneously consuming it, to achieve the desired flavor profile. The Foie Bomb will be available only while supplies last on National Donut Day – recognized nationally as the first Friday in June. Customers can get their free Foie Bomb at either Psycho Donuts location. About Psycho Donuts -- Psycho Donuts is the world’s first and only light-hearted asylum for wayward donuts and the patients who eat them, with Northern California locations in Campbell and Downtown San Jose. Psycho Donuts has reinvented the donut and has earned global acclaim for creative and unconventional flavors, coupled with a colorful and unusual experience. The Psycho Donuts experience includes an asylum-themed wait staff, a padded cell, and a stress-relieving square of bubble wrap for each customer. Psycho Donuts also features original local artwork and eclectic merchandise for sale. Psycho Donuts has quickly become a Bay Area icon, and has been featured on The Food Network, The Today Show, Fox Business News, Eye on the Bay, USA Today, Entrepreneur Magazine, Maxim Magazine, Everyday with Rachael Ray, Condé Nast, and many more. Visit Psycho Donuts online at www.psychodonuts.com.